Learn about this machine embroidered wristlet made with an embroidery machine and a pattern from Embroidery Garden. This wristlet is an in-the-hoop project and has finished seams inside. Look below for supplies you may need for this project and for a link to where to purchase the pattern. Watch this video and read on learn more about this Machine Embroidered Zipper Wristlet Bag. 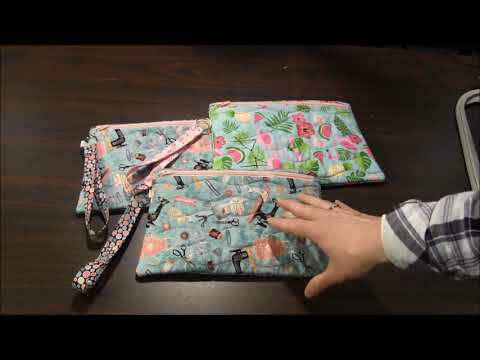 Click to watch the Learn about this Machine Embroidered Wristlet Zipper Bag video in Youtube. 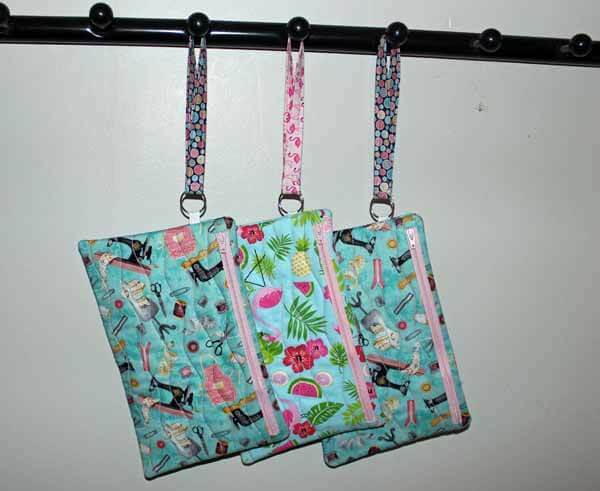 The machine embroidered in-the-hoop zipper wristlet bag pattern comes in three sizes: 5x7, 6x10 or 8x12. The files for all 3 sizes are included in the pattern purchase. 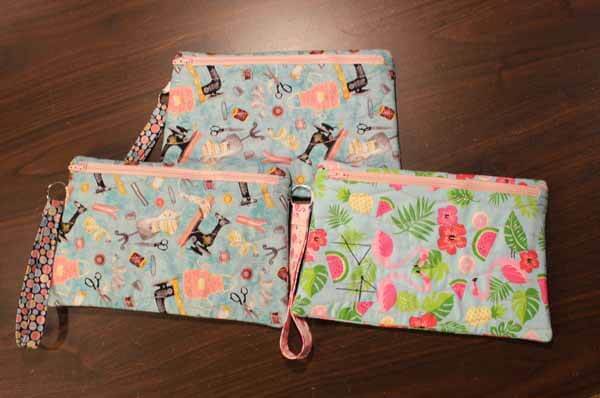 It also comes with quilted or plain wristlet patterns files, so you can choose to include the quilting or not. My bags included the quilting. The wristlet features "tabs" on both ends of the zipper to give it a finished look. It also comes with a pattern to make a flower to add to the front of the purse. I decided not to include the flower with the purses I made since it didn't seem to go with the fabrics I chose. 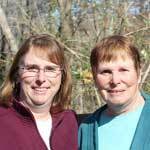 Embroidery Garden patterns come with many different embroidery file types so there should be one which will work with most any machine. But, please check before you purchase. The purchase also includes a step-by-step photo tutorial in a PDF file. 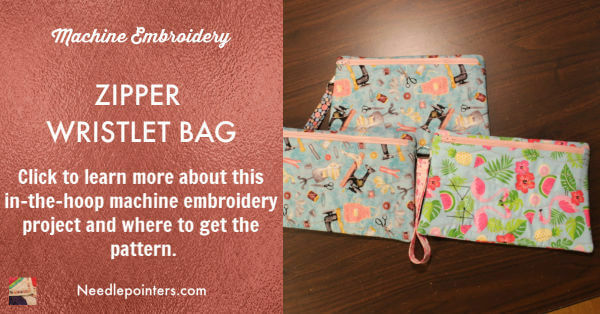 The tutorial takes you through the cutting of the fabric, guides you through the stitching process and how to finish the bag. Read the PDF instructions carefully. When cutting the fabric pieces, mark each with the letter in the cutting instructions. This letter is used later in the instructions when placing the pieces. I use flower pins which I've written letters/numbers on to identify my fabric pieces (see below for purchase). When following the instructions, always orient the hoop in the same direction as the photo in the PDF. This will help you place the pieces correctly. Read Carefully because sometimes you are flipping the hoop to the back and placing fabrics on the back. In the end, you will be turning the bag twice. First you turn it through the opening in the bottom of the bag. The second turn is done through the zipper opening. I did not have a proper sized swivel hook on hand when I made my bags. So, I just attached the strap with the split ring only. I did make a mistake when making one of my bags. The first one I made, after I popped it out of the hoop I noticed that the pellon would be showing on the inside of the bag. I realized that I had put the last piece on the top of the hoop instead of on the back. So, read the instructions carefully! I saved my bag by cutting off the incorrect piece and then using my sewing machine, I sewed another piece of fabric into the correct placement. I was then able to turn my bag and it was finished correctly. These are some clasps you can use for the lanyards.